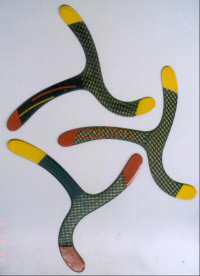 * Each Dimana’ Composite MTA-boomerang is handmade using several sophisticated instruments and unique equipment. It is individual tuned with turbulators and is tested many times by different weather conditions. * The aerodynamics solutions are result of long year theoretical studies and practical experiments - a lot of prototypes are developed, made and tested, broken and/or lost (the most in the sky) before the start of a serial manufacturing. * Several matrixes were made and several different materials (resin, reinforce- and filling-materials) were tested for optimal weight- and stiffness–performances.